The blog is early this week, because we are nearing the end of our stay and we know we will be busy in the next two weeks. This may be the last edition before we return to our other busy life. The week began on Monday with an unexpected treat. Our tenth grade class decided that they wanted to do some dancing during the break (I guess that makes them Break Dancers) and so we turned on the big amplifiers and danced in the auditorium. There was no interference this time, except for the remains of the last party which we swept up. The dancers were enthusiastic, as always. 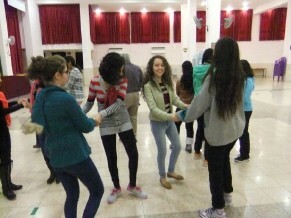 They learned Korobushka, and then did it changing partners -- something the twelfth - graders haven't quite mastered yet. 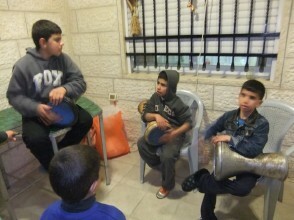 We realized that this week would be pretty much our only chance to get to the Bethlehem area and pay a promised visit to the Azar family, who opened their home to us nearly three years ago. 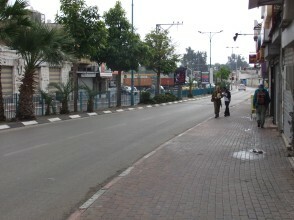 So on Tuesday we set out for Jerusalem, planning to stop on the way in Ramle. 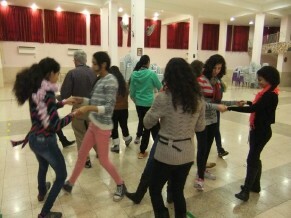 The attraction in Ramle is "Open House". Those of you who have read The Lemon Tree by Sandy Tolan will know that this is the house from which Bashir's family fled in 1948, and into which Dahlia's family moved shortly thereafter. 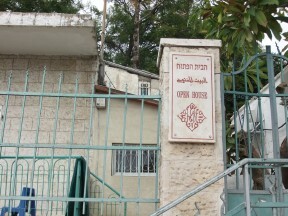 Bashir's family had lived in the house for generations, while Dahlia's had just moved to Israel from Bulgaria after managing to aviod the Holocaust. 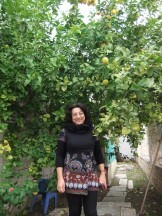 Bashir returned to the house to ask for a lemon from the tree in the back yard. Bashir and Dahlia recognized that the house contained two stories - both legitimate, and have sought to have it serve the purpose of a bridge between Jewish and Palestinian inhabitants of the same land. We were given an orientation to Open House by Valerie, pictured below in front of a very fruitful lemon tree in front of the house (in good sunlight). 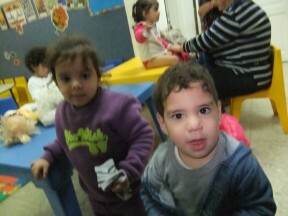 Open House serves as a daycare center for Palestinian residents of Ramle for much of the day. Valerie also has established circles of women, Jewish and Arab, who meet regularly to become acquainted and to discuss religion and their mutual problems. They don't discuss politics. 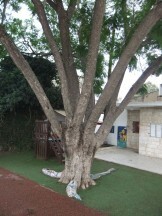 In the summer Valerie runs a large summer camp in the neighboring town of Neve Shalom for middle-school children, and she feels that this provides Open House's greatest impact. After about two hours in Ramle, we found the bus station (in the large civic center building) and, with only minor problems boarded the bus to Jerusalem. We had some time before our scheduled meeting with friends in Beit Sahour, so we set out for the old city. 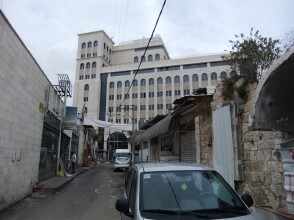 We knew that it we would find it straight down Jaffa Street, and that it was a couple of kilometers away. From that way the obnoxious taxi driver talked, it seemed to be on the other side of the world. That was our introduction to the city. 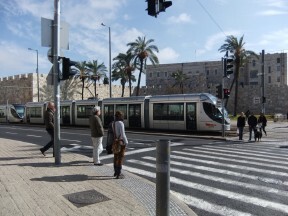 We set out down Jaffa St, with no cars and a light-rail tram down the middle. It was a warmish day for winter, and we certainly were over dressed. 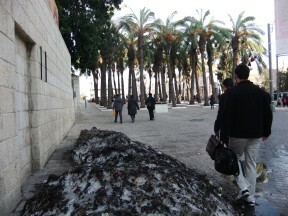 Below are some of the regular sights - black-suited men in round black hats in a hurry, armed soldiers, and a small pile of snow left over from the seventy-year storm three weeks ago. We reached the old city at the New Gate which might be called the North-West Corner of the Old City, and then walked down the wall to the left to the Damascus Gate - familiar territory from our stay three years earlier. 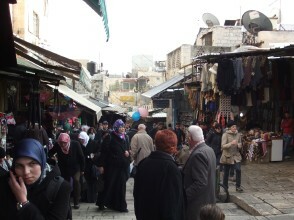 Inside we found the same bustle of shoppers heading home with bags of fruit and bread, and others heading into the Old City for prayers. We made it through the crush, past the Via Dolorosa, and the proud little Israeli flags proclaiming the steady conquering of the Muslim Quarter. Then near the Western Wall Checkpoint we made a little detour up stairs to an upper arcade. Three 10 to 12 year-old boys tried to sell us something, or be our guides. Their English was limited and they did not want their pictures taken. We were somehow rescued by a 13-year-old girl, who spoke very good English. 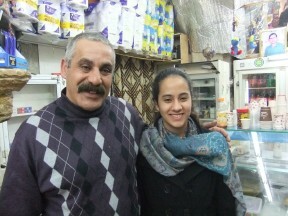 We asked her about life for Palestinians in the Old City, and she took us to meet her father. He ran a shop in a narrow hall way, featuring some 2000-year-old columns along the walls (one can barely be seen in the picture below). He was clearly proud of his daughter, who was doing so well in school. We had a nice conversation. He was not optimistic about any improvement in the future, but was hopeful for his children. 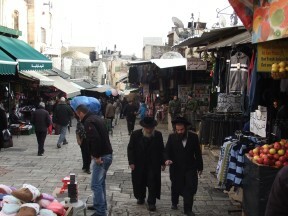 We asked him about the Israeli flags - he said, "You know, the rich Jewish people have offered me $24,000,000 for my shop, and that would make me rich for the rest of my life. But I would not sell for a billion dollars, This was my father's shop, and his father's, and I will not desert it." 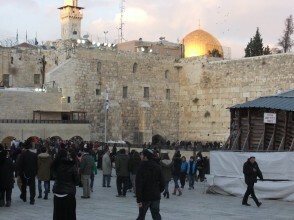 We continued on through the check-point to the Western Wall Plaza. 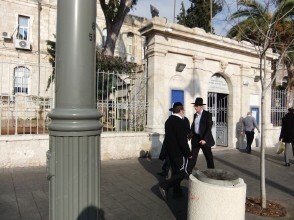 I really do not like that place, however this is the site of perhaps the only public toilet in the Old City. I was clearly marked by a sign I found unique but appropriate, in the sea of black (large and small) that surrounded us. 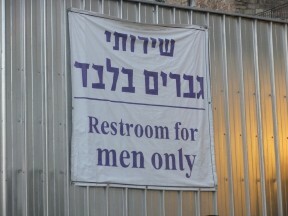 (Around the corner there was a similar one for women - only). We stayed for a short time as the setting sun illuminated the Dome of the Rock, and then followed a tribe like the one on the left as they exited the plaza. They did not leave the city, however. On the way we saw them descending steps sponsored, it seems, by the Western Wall Heritage Foundation. We picked up a brochure describing the area. In it we learned that not only were there temples on the temple mount, but also it was the very spot that God told Abraham not to sacrifice Isaac. That happened just 2000 years after the creation of the universe. Very interesting. 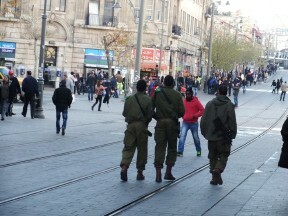 We returned to the Damascus Gate where we boarded a Palestinian bus that took us to Bethlehem. 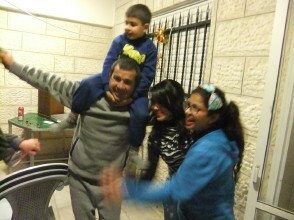 We were met by Reema Azur and two of her children, and she took us to their home in Beit Sahour, in the West Bank. 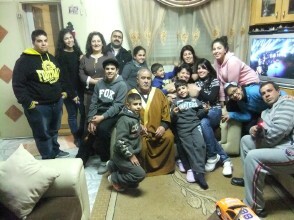 The family had hosted us previously in 2011, and it was nice to return to their comfortable home. 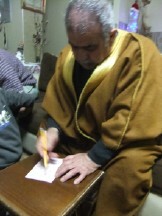 We had not noticed, but this was New Years Eve, and we had come to the house at the right time. When we realized what was in store, we excused ourselves to our room and took a two-hour nap. The nap ended as the sounds from the rest of the house increased, and a certain aroma began to fill the air. 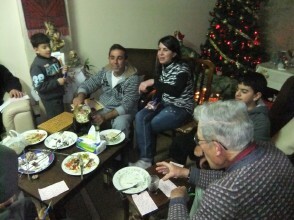 We enjoyed a superb Palestinian dinner, with salads, fresh fruit and lamb and chicken ka-bobs. Eventually most of the dishes were cleared and we settled in for a variety of Bingo. 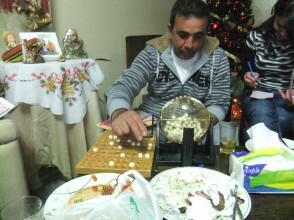 The numbers did not fill all the spaces on the cards, and the winners were successively for corners, two lines, and full house (about 20 numbers on a card), The numbers were called in Arabic and then repeated in English, and I (Sam)was playing six cards - three for me and three for Ruth, who was either doing dishes or taking pictures. 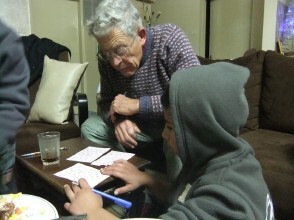 I had the help of Magd, an eleven-year-old cousin, who was also playing three cards of his own. It we he who saw that I had corners on one card, and managed to win the first prize of the evening. It became raucous when we got to full house. As soon as bingo was over out came the Tablas and dancers filled in the empty space on the balcony. Raja seemed to be the master with several apprentice Tabla players. It is hard to see their hands at full speed. Chestnuts replaced ka-bobs on the grill, we played another round of bingo, and then the real fireworks exploded at midnight. The party went on for about another hour, and finally we all said good night and were quickly asleep. 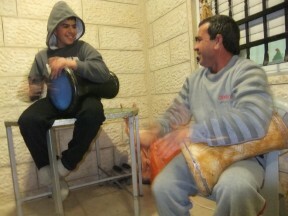 In the morning we ate a bountiful breakfast, and had time to discuss life in the West Bank. 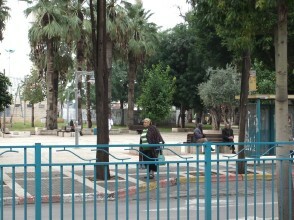 In the neighborhood of Bethlehem life is not as grim as in more remote areas of the West Bank. Still there are uncertainties that make life difficult. 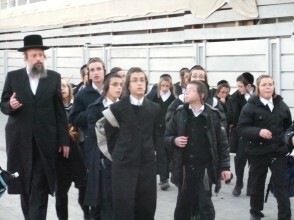 Unemployment is high and most of the good jobs are in Jerusalem. Raja can find work, but it is hard to keep a steady job amid the vagaries of identity cards and border closings. 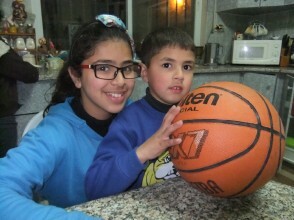 Reema's teaching job in Hebron is more secure, but it is a thirty-minute drive away and gas costs around $8 a gallon. For a car at 30 mpg that means driving to Hebron and back would cost $30. They did not expect anything helpful to come from the current negotiations, but they remained hopeful. We returned by Palestinian bus to the Damascus Gate - delayed 15 minutes because two of the riders did not realize that their "Christmas Amnesty" permits had expired with the old year. 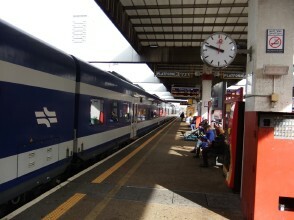 This time we took the light rail to the bus station, and the express bus to Haifa arrived in a little over two hours. The 166 took us home once again.